Pink Pitcher Vase with Iris and Leaves Discounts Apply ! 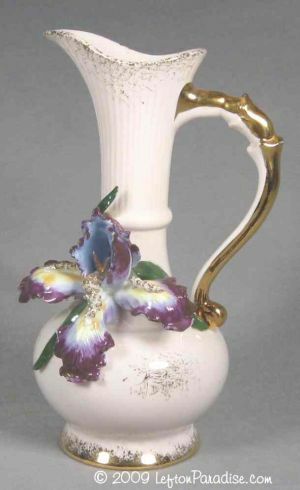 A pretty pink pitcher vase with applied iris and leaves. There is a tiny flea-bite on a petal. Otherwise, this vase is in very nice condition. The vase stands 6¼ inches tall and has a Lefton color crown.